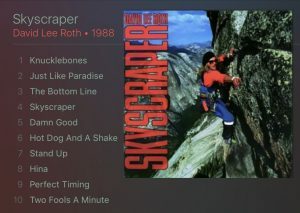 Skyscraper was David Lee Roth’s second full album as a solo artist, the follow up to to his solo debut, 1986’s successful Eat ‘Em And Smile. It was also the last to feature the original “Eat ’em and Smile” band, as bassist Billy Sheehan departed shortly after the album was finished. Following Van Halen’s monster 1984 album (and a #1 single, Jump), DLR went through a public (and quite nasty) mid-1985 divorce from the band. Both acts carried on – Van Halen snagged vocalist Sammy Hagar, while Roth went with “the best band money could buy;” guitarist Steve Vai, bassist Billy Sheehan and drummer Gregg Bissonette. Many industry big shots put their money on Roth to be the more successful of the two, as they felt it was impossible for a band to replace such an iconic frontman. Plus, Van Halen’s management, crew and producer all stuck with Dave, so it seemed like they, as insiders, knew where the talent really was. Round one ended in a draw: Both acts released successful albums and played arena tours in 1986; Van Halen sold more units, but they were considered “poppier” than before and had multiple hit singles (without videos, no less!) from their album, 5150. By early 1988, it was time for both acts to follow up. Roth struck first withSkyscraper. This time around, he disposed of producer Ted Templeman (who produced all of the Roth-era Van Halen as well asEat ‘Em And Smile) and self-produced the album with guitarist Steve Vai. The result was a less unified, synth-heavy, cold sounding album that was too high-tech for most of his fan base. Although it spawned a top ten single (“Just Like Paradise” peaked at #6 in Billboard) and a couple of album rock tracks (“Damn Good” and “Stand Up”), it didn’t hold up in the long run. This was the album that broke the spell of David Lee Roth. The first crack in the façade was when bassist Billy Sheehan left the band post-album but pre-tour. (He was replaced on stage by drummer Gregg Bissonette’s brother, Matt.) Although it seemed like a minor detail at the time, it sent a loud and clear message out publicly: Being in Dave’s band is NOT the coolest gig in town anymore. Making it more painful, Sheehan didn’t even stick around long enough for the “Just Like Paradise” video. He then founded Mr. Big, whose first album came out in late 1989. More dissonance occurred concerning the single; Steve Vai, who co-wrote the majority of Roth’s first two albums (but not “Paradise”), loathed the song (although this wasn’t common knowledge at the time). Additionally, having secured the high-profile gig with Roth, he became a known as an A-list guitarist and his name was out there for future projects. (More on that later.) But Vai, being the consummate professional, appeared in the “Just Like Paradise” video and completed the tour. Once again, David Lee Roth embarked on a successful arena tour, supported at various times in the states by Faster Pussycat and Poison. Poison’s popularity exploded during the tour, and by the end of 1988, they were headlining arenas on their own. Some fans grumbled that his setlist routinely covered only four classic Van Halen tunes on his 1988 tour. (Five if you count “You Really Got Me.”) The US leg commenced in March (Lakeland, FL) and finished in August (Troy, MI). The international leg included Western Europe, Japan and Australia. Meanwhile, Van Halen released OU812, their second Sammy-fronted album in May, and it replicated the 5150 chart position of #1, its several hit singles and a successful tour, though marred by the controversial “Monsters of Rock” traveling stadium festival. So once again, Dave wasn’t able to upstage his former band. But in the end, the album was a letdown for the fans of Eat ‘Em And Smile and it marked the end of the Roth dynasty. After the tour, Steve Vai would jump ship (eventually replacing Vivian Campbell in the now-huge Whitesnake), a second blow DLR’s career would never recover from. Roth’s next album, 1991’s A Little Ain’t Enough (recorded with guitarist Jason Becker) was far less successful and produced no memorable singles (or videos); the follow-up tour paired him with openers the downward-trending Cinderella (ironically an opener on theEat ‘Em And Smile campaign now on a downward trajectory after their own arena-headlining tour) and newcomers Extreme, before being scrapped for overall apathy. Meanwhile, Van Halen hit #1 for a third time with their 1991 album For Unlawful Carnal Knowledge (and accompanying tour); and for the first time in this rivalry, Van Halen produced the better-known video (“Right Now”) of the pairing. It was all downhill from there for Dave, who never again regained a foothold on rock’s A-list, despite pairing up with Eddie and Alex Van Halen many years later.